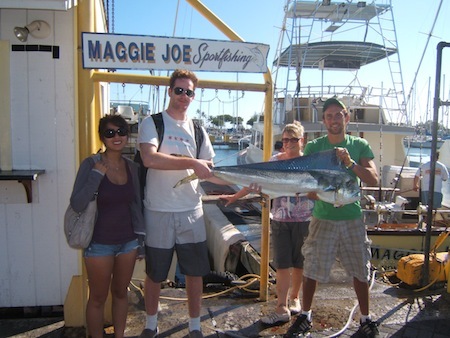 The Maggie Joe spend the day sport fishing out of Waikiki with Una, James, Helen and Eric. 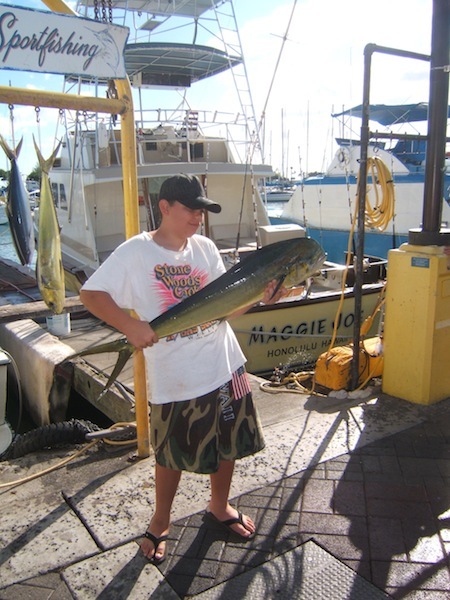 Eric caught this 23lb Mahi Mahi with the bait fish brought in by the others. Nice job guys! 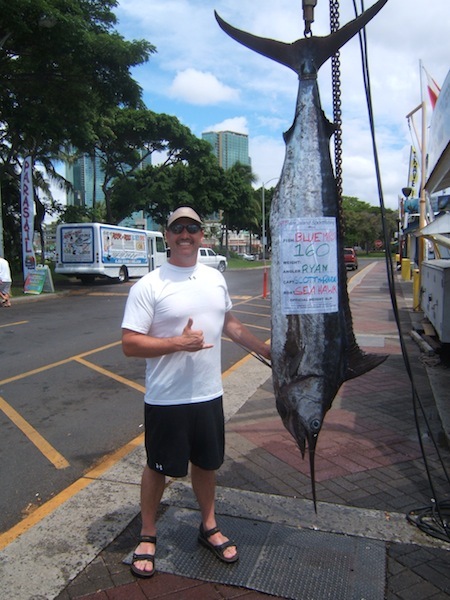 The Sea Hawk had an excellent day sport fishing out of Waikiki with Bill, Alan, Tracey and Montey. 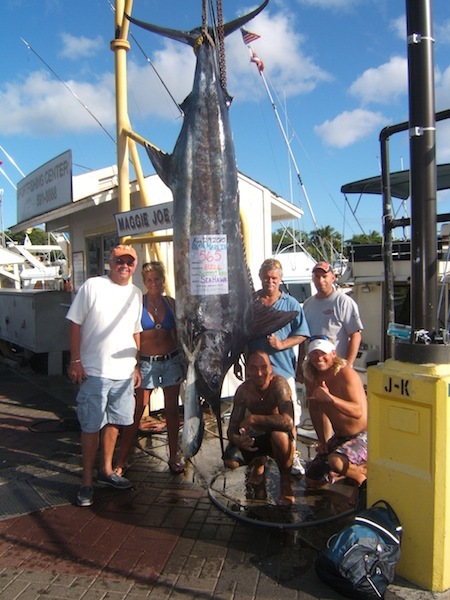 They brought in a Mahi Mahi and a 565lb Blue Marlin. 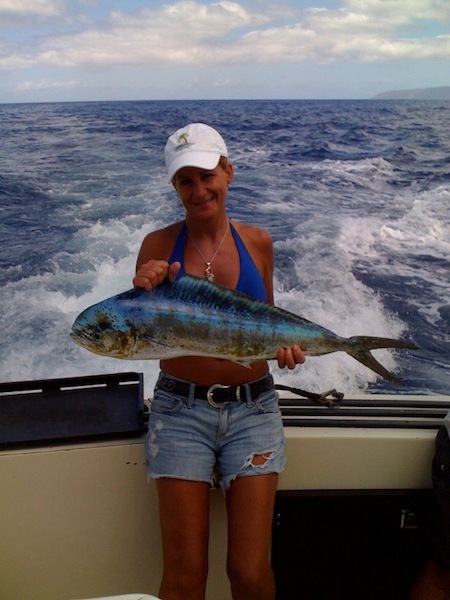 Tracey brought in the Mahi Mahi and Bill caught the Blue Marlin with the help of Captain Scotty and Mate Tony. 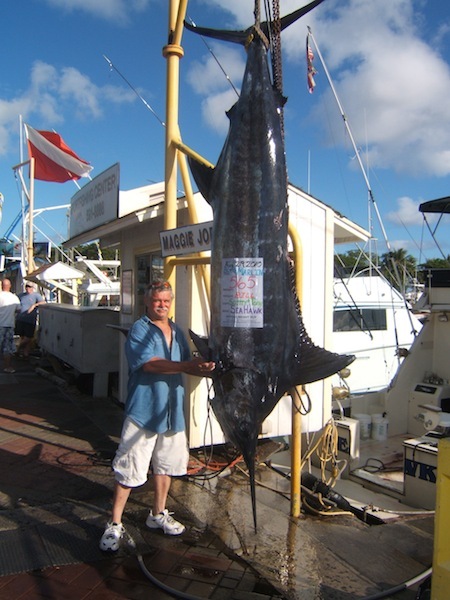 Bill will receive a free 1/2 day shared charter for catching a fish over 300lbs as part of our “You Catch, You Win” 60th Anniversary Celebration. We also want to say Thank You! to Tracey for sharing some of her pictures with us to post here. We always love getting pictures to add to our collection. Great job guys! 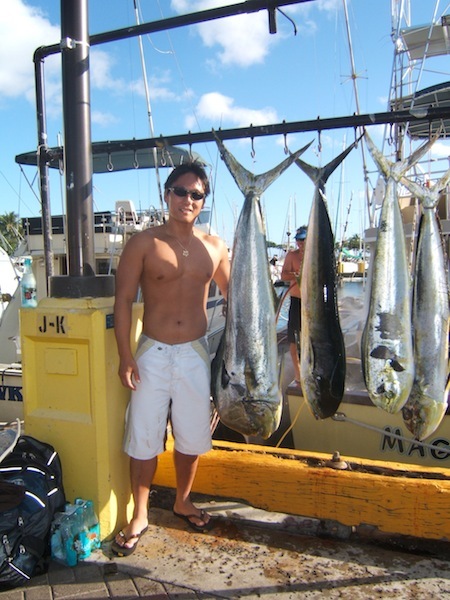 Jun, Jeong, Aldon, Paul, Aaron and Judah joined the Maggie Joe for a day of deep sea fishing out of Honolulu. They brought in 4 Mahi Mahi today. 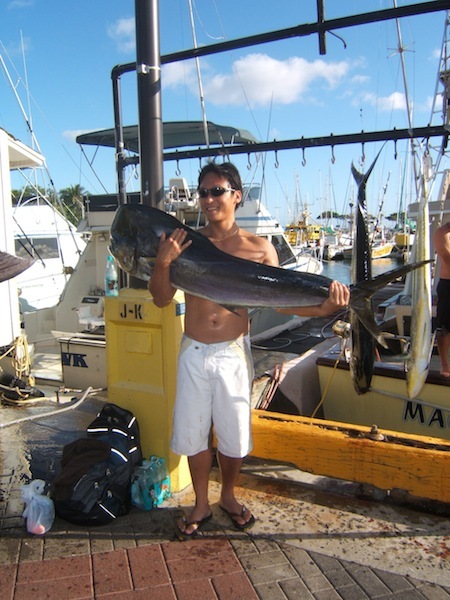 Jeong, Paul, Judah and Jun each brought in a Mahi Mahi. 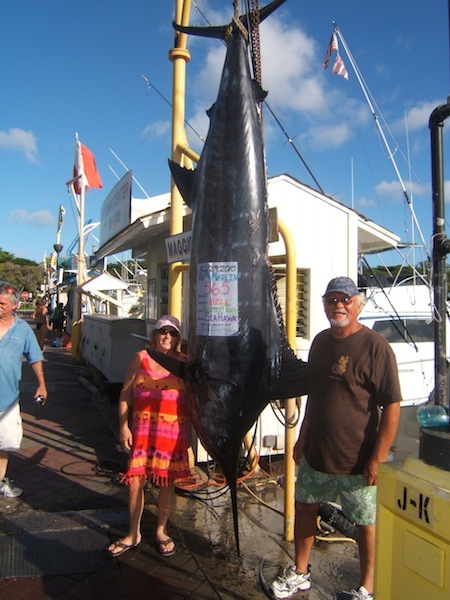 Jun brought in the largest one, a bull weighing in at 42lbs. Nice job guys! 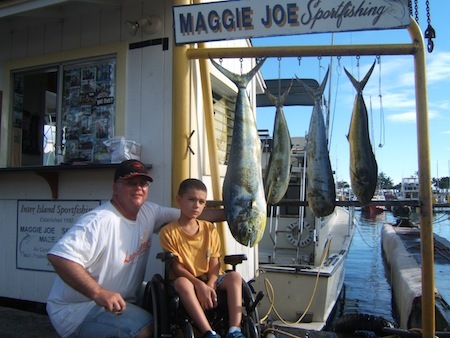 The Maggie Joe had a great day deep sea fishing off Oahu. 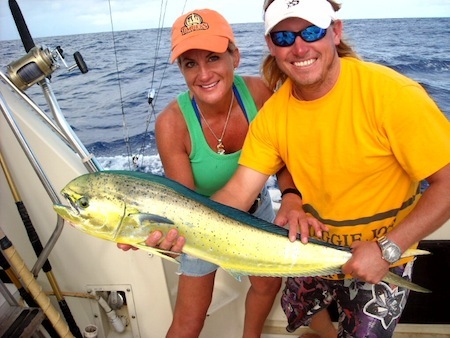 They Brandon and Taylor brought in these 2 Mahi Mahi while out on the water with their family. 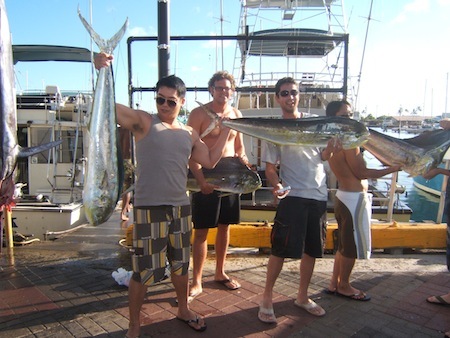 Nice fish guys! 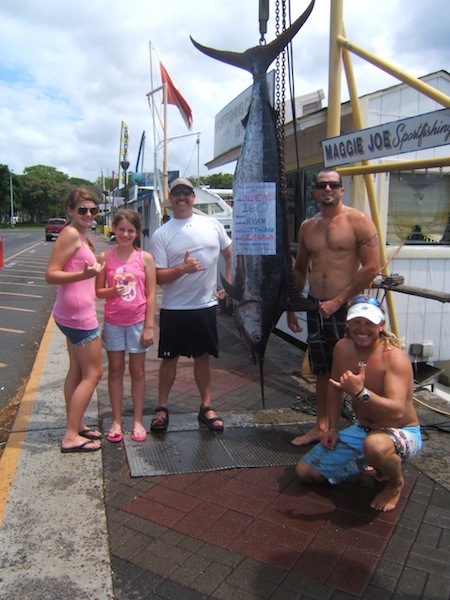 Maggie Joe had a great day sport fishing out of Honolulu with Matt, Kyle and Dan. 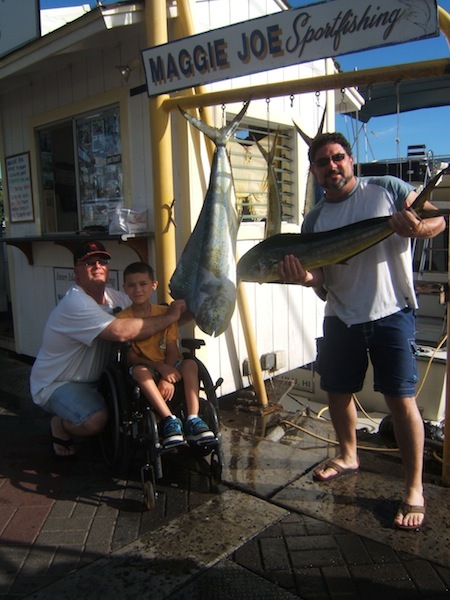 Kyle and his dad Matt caught the bait fish that helped land 4 Mahi Mahi for the boat. Nice job guys! 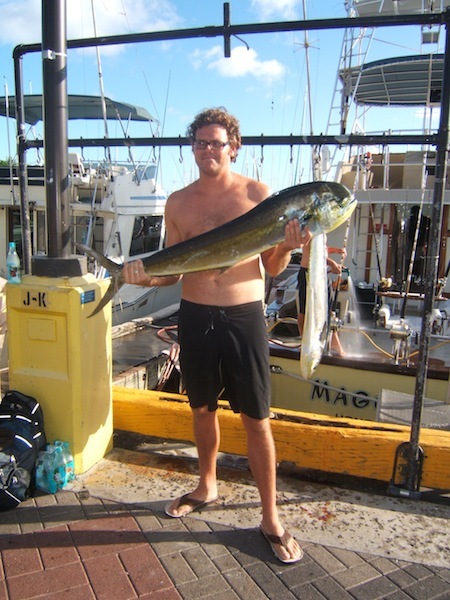 Jeff joined the Maggie Joe for his bachelor party and did some awesome fishing. 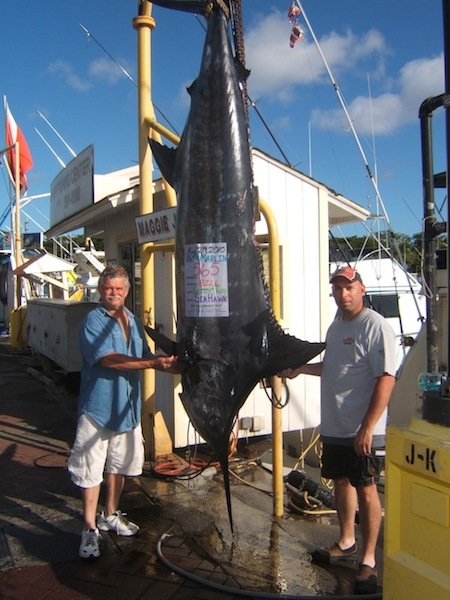 Together Jeff and Joe brought in this 427lb Blue Marlin. Check out the video of them pulling it on board the boat. What a fish! 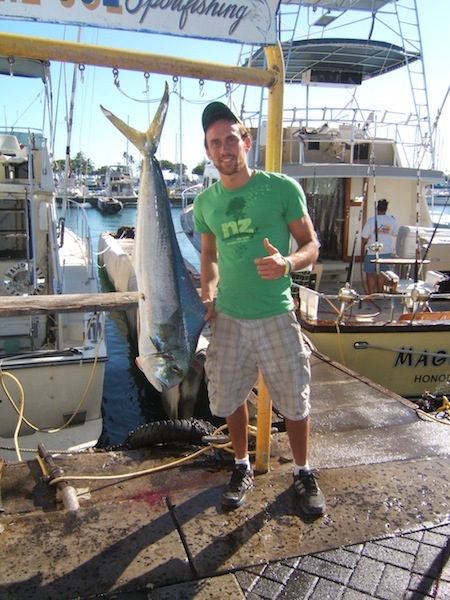 Congratulations Jeff on your upcoming wedding and your big catch! 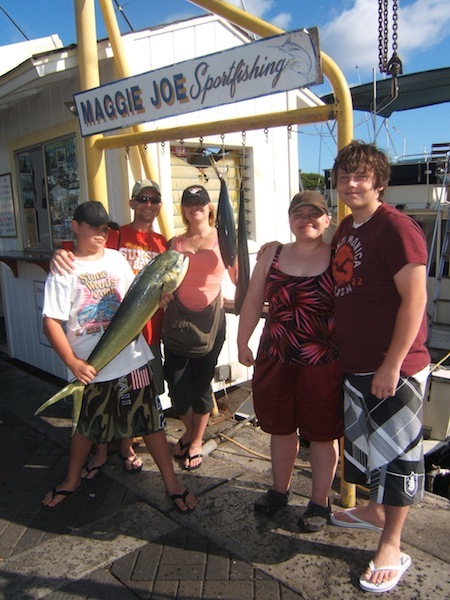 Because their fish was over 300lb they get 1 free 1/2 day share to use the next time they come out deep sea fishing with Maggie Joe Sport Fishing, as part of our “You Catch, You Win” 60th anniversary celebration. 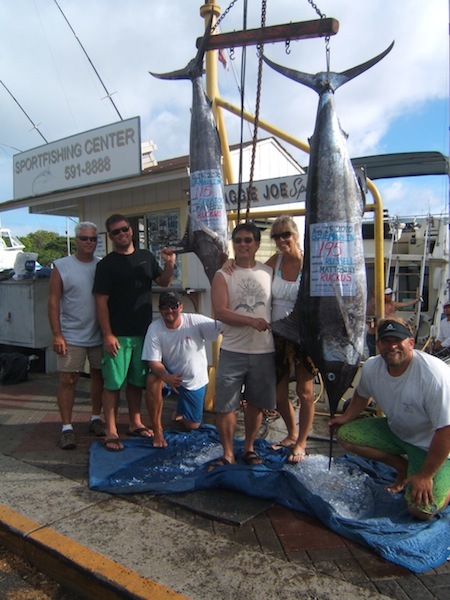 The Maggie Joe is still out fishing, but Captain Mike just sent in this photo to show us what they have been up to out deep sea fishing Hawaii’s beautiful waters. 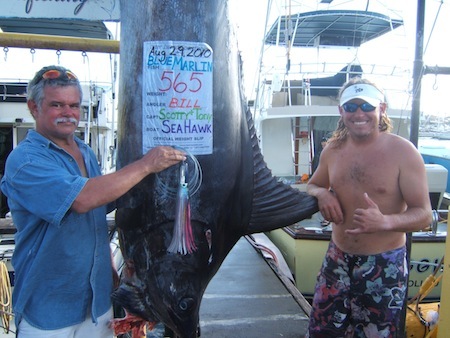 We’re guessing this Blue Marlin will be weighing in somewhere around 400lbs. We can’t wait to see it hanging on the dock! 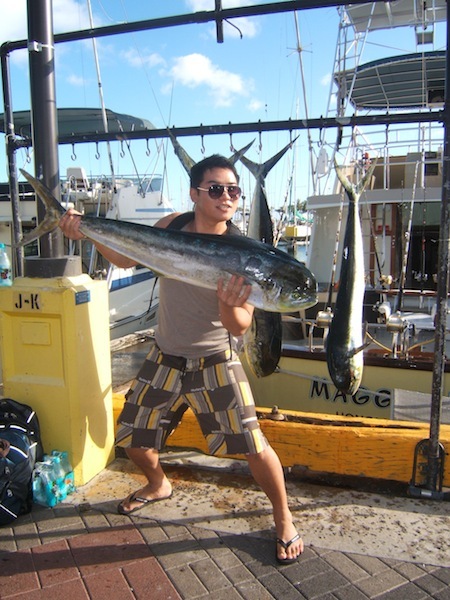 The Sea Hawk went out for a day of sport fishing off Oahu. 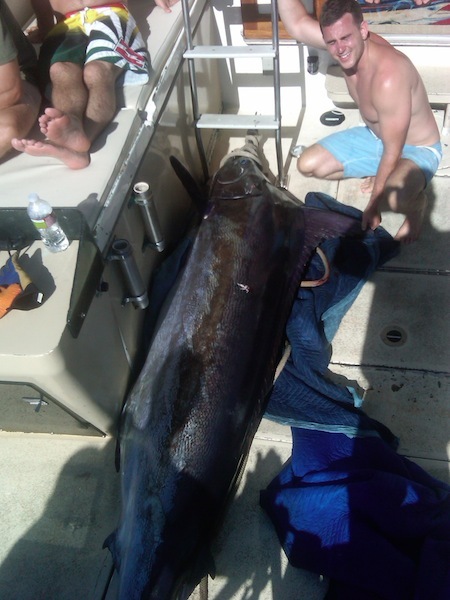 They brought in this 25lb Short Billed Spearfish. 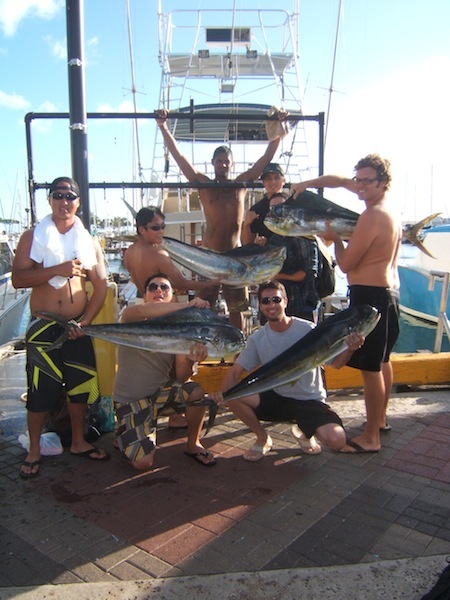 Nice catch guys! 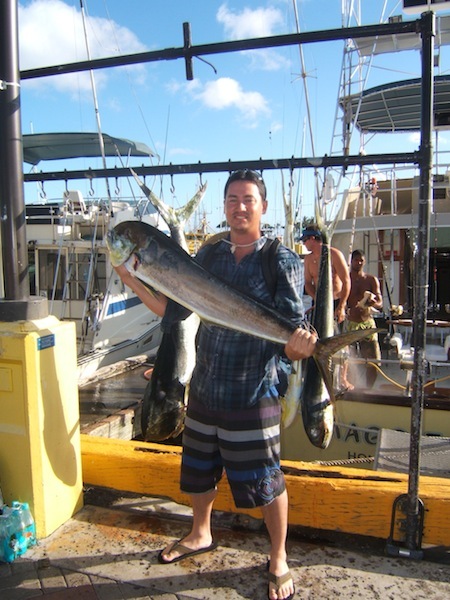 The Ruckus had quite the day sport fishing off Oahu today with Russell, Derrick and Shannon. 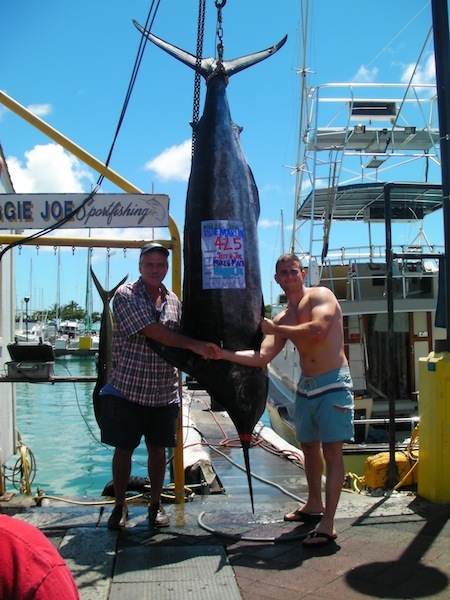 They brought in 2 Blue Marlin. One weighed in at 195 lbs and was caught by Russell. 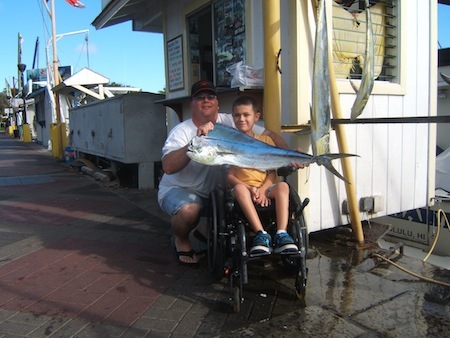 Great job to the Anglers and Captain Matt and Mate Billy for finding those fish! 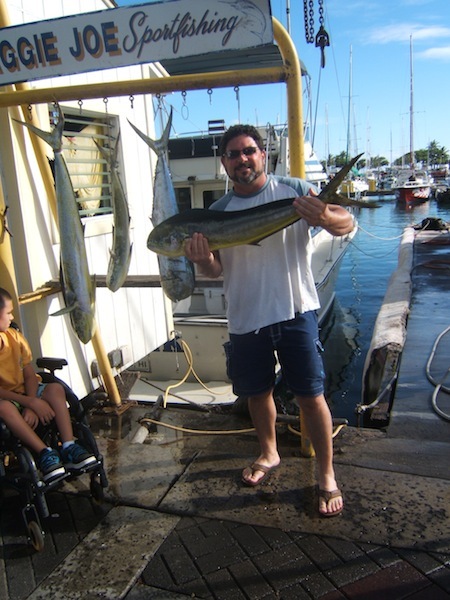 Ryan and his two daughters joined Captain Scotty and Mate Randall on the Sea Hawk for an excellent day of deep sea fishing off Oahu. 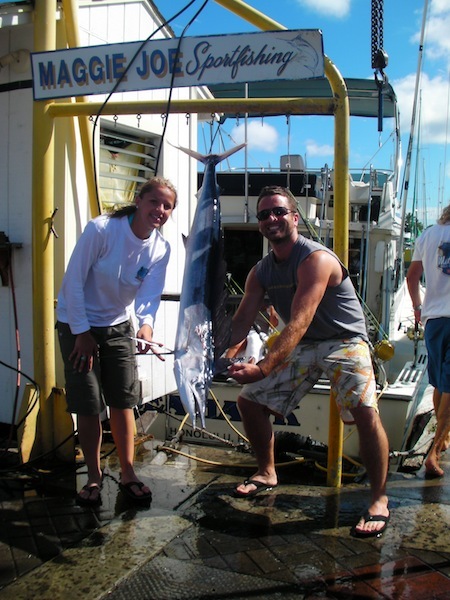 Ryan brought in this 160lb Blue Marlin. Way to go!